You Asked: My brother will be starting on campus this January. I want to get him gift certificates to local hangouts. Any suggestions? Fantastic ! Congratulations to your brother ! Okay first things first. Your brother needs at least a Skidmore sweater, mug, or snuggie. Yea, the Skid shop sells snuggies. So a certificate to the Skidmore Shop is a must. So many students go to Uncommon Grounds because it is a fantastic place to do homework. Bagels, coffee, and wifi. What else could you possibly need on a weekend afternoon? Nothing ! Plum Dandy. Frozen Yogurt deliciousness. I really do not have to say much more. I really enjoy finding cool sweaters, accessories, and such in consignment shops. There is a really good one in town. Its called Eighty Twenty Boutique; the owner is really sweet and is actually lending clothes to the Fashion Show I am directing. I am guessing your brother likes food. I mean who doesn’t?! A really fun, easy, chill place to eat with great burgers and a fun theme is Circus Cafe. You can not go wrong in this town. This entry was posted in Formspring, Off Campus Fun and tagged coffee, food, fun, i love gift certificates, Saratoga, town, town is awesome, where to go, you can not go wrong on December 11, 2011 by Altagracia Montilla. You Asked: I heard the dining hall at Skidmore is really good. is this true? Do you like the food? I LOVE THE DINING HALL (ascetically) and THE FOOD. The dining hall has such great food. There are not many campus dining halls where you can find meals like sushi, duck, shrimp, and lamb being served. The Skidmore College Dining Services is so good at making meals new and exciting every day and there are always so many options including vegan and vegetarian options. This entry was posted in Formspring, Living on Campus and tagged dining hall, food, yum on October 25, 2011 by Altagracia Montilla. Great question FormSpring! I do not have a special diet but if YOU do, do not worry! Skidmore’s dining services accommodates special diets. The great people at dining services will work directly with you to discuss which meals are okay to eat based on your special diet and or allergies; meals can be pre- made separately. The dining hall has a food preparation area dedicated to students with special dietary needs and or food allergies. 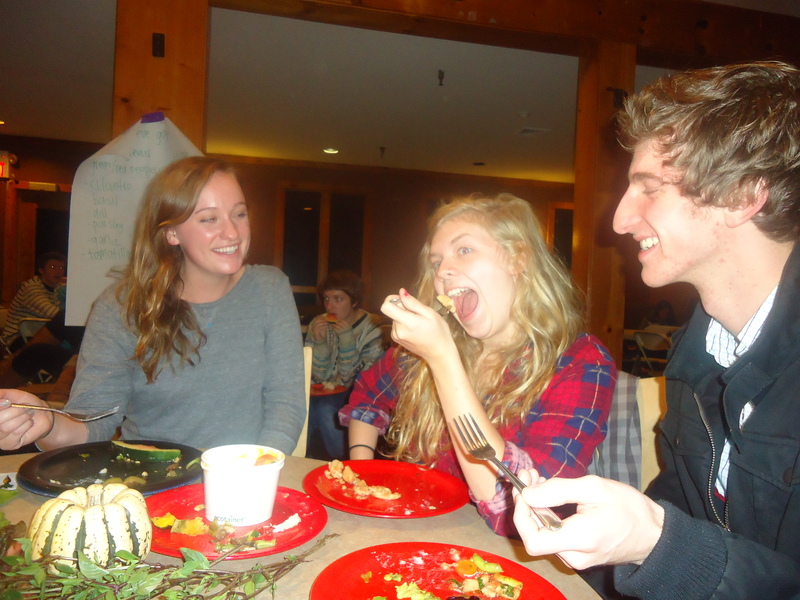 Everyone gets to om nom nom at Skidmore! This entry was posted in Living on Campus, Uncategorized and tagged dining hall, food, hungry, special diet, yummy on October 21, 2011 by Altagracia Montilla. 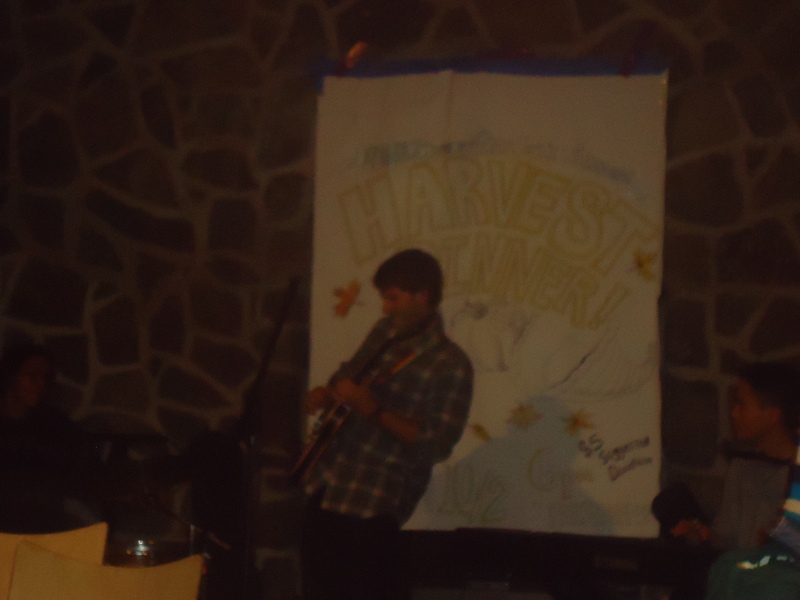 Last Sunday the Environmental Action Club* hosted their annual Harvest Dinner. Perfect timing too because on Sunday I was not in any mood to cook. Having to cook for yourself can be a pain in the rear sometimes. Most times your dinner burns to dust or is nothing more than a bag of 65cent noodles due to lack of time. I think my problem is that I’m often to tired to cook. But I digress. So Sunday= Harvest Dinner= so much ‘om nomming’ on veggie goods. Amongst other things the EAC is responsible for maintaining the 40×60 Skidmore Garden* known for its success in growing produce such as radishes, beets, lettuce, peas, and spinach. Other vegetables include zucchinis, carrots, squash, broccoli, tomatoes, onions, leeks, beans, cucumbers, eggplant, peppers, and various herbs. These vegetables are used in the dining hall. At the beginning of the semester the EAC organizes a Harvest Dinner using only foods grown in the Skidmore Garden. The Dinner was held at Fasltaffs. Funny how one night Falstaffs hosts a party, black lights and music vibrating the floor, and the next its the location for a dinner, dim lights and modest table settings. Every table felt a bit like Thanksgiving. People were chatting, some with their mouths full anxious to discuss the events of their weekend. And others were meeting new friends. 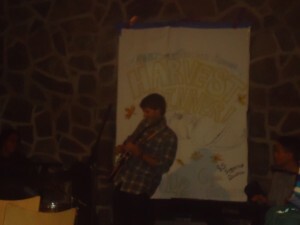 All of which occurred over delicious food thanks to both the EAC and Dinning Services and to the tunes of a student band. Even desert was served, a delicious apple crisp (OH.MY.GOSH) with the perfect amount of crunch. *The EAC is also know for running the campus composting project on campus. 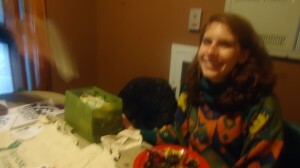 All homes on campus are expected to use their composting bucket, provided by the EAC. It is a great club to join for all those interested in environmental issues regardless if an Environmental Studies Major, or those who just have a green thumb. *The Skidmore Garden is not only used to grow yummy produce. For instance, an environmental studies major studying forest conservation,Joe ’14 has been obtaining soil samples from the Skidmore Garden which are being tested at UMass Amherst. This entry was posted in Clubs&Organizations, Events and tagged community service, compost, dinner, Environmental Studies, food, garden, organic on October 5, 2011 by Altagracia Montilla.